Ensuring food security and halting biodiversity decline are two of the most urgent (and interconnected) challenges facing humanity in the 21st century. Drawing on both the natural and social sciences, we are implementing an interdisciplinary research agenda to address these challenges. 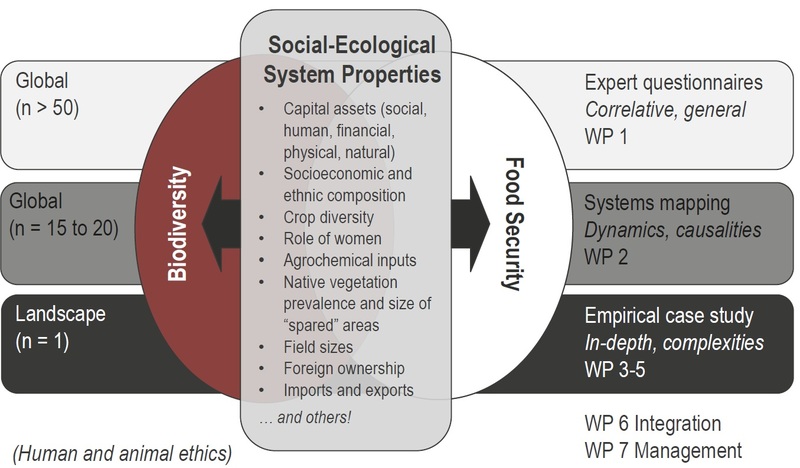 Our goal is to develop and test a global theory that explains which properties of social-ecological systems benefit both biodiversity conservation and food security (and which may benefit one but not the other). Such a holistic, systems-oriented approach radically differs from existing work: Especially in the natural sciences, the most prominent framing at present focuses on the question how to increase agricultural yields without compromising biodiversity. However, at a global level, a lack of agricultural yields is not the cause of hunger – hence, attaining higher yields on its own cannot guarantee improved food security. Similarly, many poor countries lack the institutional mechanisms needed to safeguard biodiversity, sometimes both in high-yielding and low-yielding landscapes. Because of the limitations of emphasizing agricultural yield above other (at least equally important) variables, our work therefore aims to develop a more holistic framework that considers agricultural yield as just one of a range of interdependent properties characterizing rural landscapes in developing countries. The project uses a multi-scale approach that balances the likely trade-offs between depth and generality. We will investigate rural landscapes as social-ecological systems at three levels of detail. First, drawing on expert knowledge, we are putting together a global database of at least 50 relevant systems, relating their general properties to indicators of food security and biodiversity. Second, we are planning to conduct in-depth workshops on 15-20 social-ecological systems worldwide to reveal in more detail the causal linkages between system properties, food security and biodiversity. Third, we are working on an in-depth empirical case study on food security and biodiversity in Ethiopia. This complements the other components by highlighting the nature of potentially important regional subtleties. Through time, we hope this project will produce new tools and a holistic theory of relevance to researchers, policy makers, supra-national bodies and non-governmental organizations worldwide. We hope our work can provide an urgently needed alternative conceptual framework, grounded in empirical evidence, for how to meet the complex and interconnected challenges of ensuring food security and halting biodiversity decline.